Whether you’re looking to paint or epoxy your floor, or are just looking to extend the life of the concrete slab on which you park your vehicle, repairing the cracks and chips in the floor is simple and effective. How do you repair the cracks in your garage floor? Learn how from Blue Sky Builders. This procedure is actually quite simple—taking less than 2 hours and costing very little. 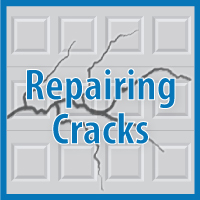 Step 1: Clean the crack with a wire brush or diamond grinder, sweeping away debris or vacuuming the crack. Step 2: Use a chisel and hammer to break away deteriorating edges, creating either an inverted-V shape or vertical edges. Clean again. After cleaning the crack, there are a variety of choices for filling the crack. Depending on the size of the crack, you could use a product applied by caulk gun, like QUIKRETE concrete repair or QUIKRETE Polyurethane Concrete Crack Sealant for small cracks, quart-sized QUIKRETE Concrete crack seal for larger cracks, or powder-based mixes for cracks even larger. Depending on your choice of repair, the following videos can walk you through the next steps. Do You Need More Than Floor Repair? Contact Blue Sky Builders for more information on getting your garage in shape for summer. Should You Get a Floor Mat for Your Garage?